Tom at Montalk.net has been working on a series of in-depth research articles concerning the Big Picture of what's going on on Earth and in the cosmos, focusing on the role of advanced alchemy, or as he calls it, high Demiurgic technology, in a time war scenario where the prize is the destiny of the universe. 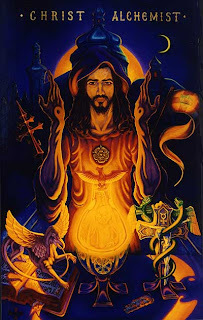 One side in this spiritual war is led by the corrupted Demiurge toward materialism and hierarchy, and the other is led by the Christos toward awakening and liberation. How this pertains to us personally, I leave to your own insight and imagination... but if you're interested in such things, I recommend you check out this series. I don't know if Tom is right, but he's certainly put together some thought-provoking material. Here's a quote from part 7 that I like: "But it may be equally said — and this is absolutely crucial to understand — that a certain etheric pattern sustains a certain physical pattern. Thus every particular configuration of space, time, matter, and energy is held that way by an underlying 'base level' thoughtform, the common denominator shared by elements of that configuration, which perpetuates the default behavior of that system. All additional thoughtforms merely deviate the system’s probabilistic behavior away from this default." I like that theory because I frequently wonder in frustration: "Why in God's name do people tolerate the every-man-for-himself capitalistic system? Why do they tolerate their wage slave jobs? Why do they tolerate the existance of privately owned central banks which charge interest to governments on money that was created out of thin air?" The idea that humankind's acceptance of that stuff could be a result of an underlying etheric pattern (which has crystalized the present cultural and physical state of affairs), rather than being a result of some collective moral failing, is comforting in a way. The idea that an underlying etheric pattern has been propping up the sociopathic "Powers That Be" helps makes sense of what is otherwise hard for me to grok. On a lighter note, have you heard Tom's mp3 "Searching for Agartha" on the music page? It's quite good. Good point. It's a little hard to assimilate at first, but we can see the evidence of it. Pure thought precipitates down through the layers of manifestation to the etheric and finally the physical. Somehow I have this notion of reality as a system of energy frequencies undergoing cycles upon cycles, which helps explain to me why certain patterns prevail at certain times despite all the best efforts of individuals to change it. I Went through these links and i found them quite useful ! Thank you !